Robert Goddard was born on October 5, 1882 in Worcester Mass. In 1913 he began experimenting with rockets, and got his first 2 of 241 patents in 1914. His earliest designs used solid fuel pellets, which were fed into a firing chamber like a repeating rifle. Rocketry was greatly advanced in WWII, especially by German scientists. When asked about their development of rocketry, they credited the works of Robert Goddard as the foundation of their science. 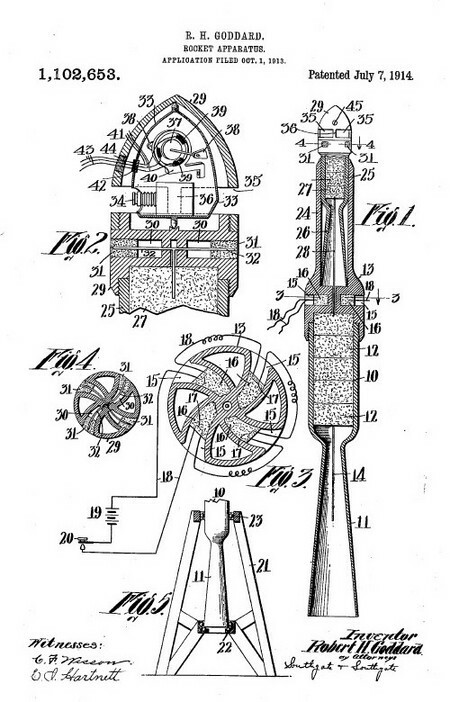 One of Goddard's designs was modified to become the Bazooka anti-tank weapon in WWII. After working on solid fuel rockets, he pioneered the use of liquid fuel rockets.